We can offer your group a professional level of support with our Broom Waggon service. We'll follow you in our vehicle giving you that piece of mind that assistance is right behind you. We'll also carry your spare clothing. We've been riding these roads for 15 years and no one knows them better than us. We'll advise you on the best routes to take, where not to go, and on Mont Ventoux in particular, we'll advise on what the conditions will be like at altitude relevent to the current weather conditions. With us you'll now have the option of riding some of the quieter roads without worrying about finding a lunch stop. 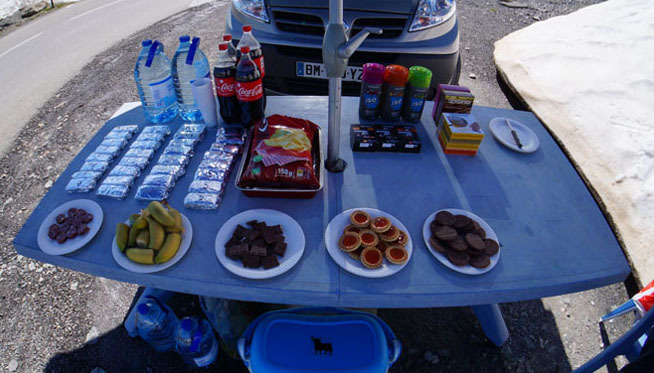 We'll provide a full roadside picnic with bread, cheese, ham, saucisse, bananas, sweets, drinks and basically anything you want us to personalise your lunch stop with. Veloventoux have been providing full cycling and accommodation packages since 2003.
yourselves and your bikes from the airport or TGV station we can help. The maximum number is 12 but soemtimes larger groups can be catered for. Please contact us for a quote if your group size is more than 12.